Toasted UK, created by the same team behind Taste of Napoli, offers a huge range of takeaway toasted sandwiches, both sweet and savory, served from breakfast until the late evening. 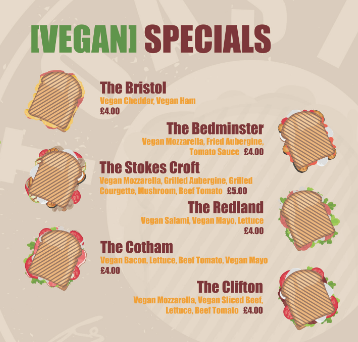 Find us in Bristol’s Shopping Quarter, sandwiched (pun intended!) between Broadmead and Cabot Circus. Click here for directions and opening hours. Our team is also on hand to serve you freshly-ground Italian import coffee, the same that you’ll find at Taste of Napoli, and dubbed as some of the best coffee in Bristol.